It looked like it could become a big title in a genre I love. Ava is a firebug—she can start fires with her mind. Which would all be well and good if she weren’t caught in a deadly contract with the Coterie, a magical mafia. She’s one of their main hitmen . . . and she doesn’t like it one bit. Not least because her boss, Venus, killed Ava’s mother. When Venus asks Ava to kill a family friend, Ava rebels. She knows very well that you can’t say no to the Coterie and expect to get away with it, though, so she and her friends hit the road, trying desperately to think of a way out of the mess they find themselves in. Preferably keeping the murder to a minimum, in Lish McBride's Firebug. 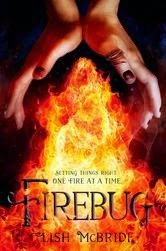 Reading Firebug was like slipping into a favourite pair of jeans and then sliding under a snuggly blanket with a cup of tea. Or maybe more like meeting a dear friend for coffee. It was so comfortable and familiar and a much needed hit of relaxation. That said, Firebug isn't just the same old, same old paranormal YA (or YA on the cusp of NA, really). There are some details and a twist here and there to keep this book from feeling stale or rote. There's something reassuring about the way that it hits all those familiar notes that I love about the genre, but it also gave me a fresh new story to dig into. I love Ava, the heroine of the piece. She's snarky and kickass but she's also vulnerable when it comes to her relationships. She's only close to three people, and two of them have only come into her life in the last few years, so I think Ava holds onto them really tightly, afraid that something/someone is going to take them away. She's also got all of her emotions running very close to the surface, with a temper, tears and sarcasm to match. Ezra and Lock could easily have been interchangeable hot best friends. I'm so thrilled that they were very well defined with their own histories, hang-ups and powers to boot. I loved how the three interact together and how they all relate to each other one-on-one as well. These are the kind of boys that every teenage girl wants to have in her life - the perfect mix of loyal, strong, supportive and snarky. I hope that this friendship remains at the core of the series, regardless of how things develop around it. I also hope we see more of Ezra's home life in the next book! Beyond these characters, who I clearly adored, the plot itself is pretty solid. There's an appropriately scary big bad, with evil henchmen. There's some flashy action scenes rife with supernatural powers, pain and plenty of tension. There's a sense of inevitability about the confrontation between Ava and her boss, Venus, and Ava's impression of Venus as virtually invulnerable amps up the tension and stakes of all the actions that she and her friends take to try to wriggle free of Venus' clutches. Last but by no means least: that ending? Man. That's all I'll say about it. No wait, I'll also say that I loved it, I felt it was completely keeping with the characters and that I hope the next book or two resolves things. If you were concerned that the saturation of the paranormal YA genre had choked the life out of anything new, rest assured that *GREAT* Paranormal YA is still being published. Check out Firebug to scratch that itch, feed that addiction, and have a fantastic reading experience. For fans of urban fantasy, paranormal YA, good books.